The talented Cardinals, led by Orlando Cepeda and Lou Brock, cruised to the National League pennant despite losing ace Bob Gibson for two months with a broken leg. The Red Sox, meanwhile, achieved "the impossible dream" after going from ninth place in 1966 to first in 1967, clinching their first pennant since 1946 on the final day of the regular season. Gibson started Game 1 in Boston, and Jose Santiago was his mound opponent. The Cards scored a run in the third, but Santiago himself tied the game with a solo homer in the bottom of the inning. It remained 1-1 until the seventh, when Brock singled, stole second, and came around on a pair of infield outs. That's the way it ended, 2-1 St. Louis. In Game 2, Red Sox ace Jim Lonborg didn't allow a hit until two men were out in the eighth, when Julian Javier doubled into the left-field corner, and he finished with a sparkling one-hitter. The final was 5-0 Red Sox, the last three runs coming on Carl Yastrzemski's three-run homer in the seventh. In St. Louis for Game 3, the Cardinals took a 5-2 victory behind the complete-game pitching of Nellie Briles. Third baseman Mike Shannon led the Redbird attack with two hits, one of them a two-run homer in the second inning. 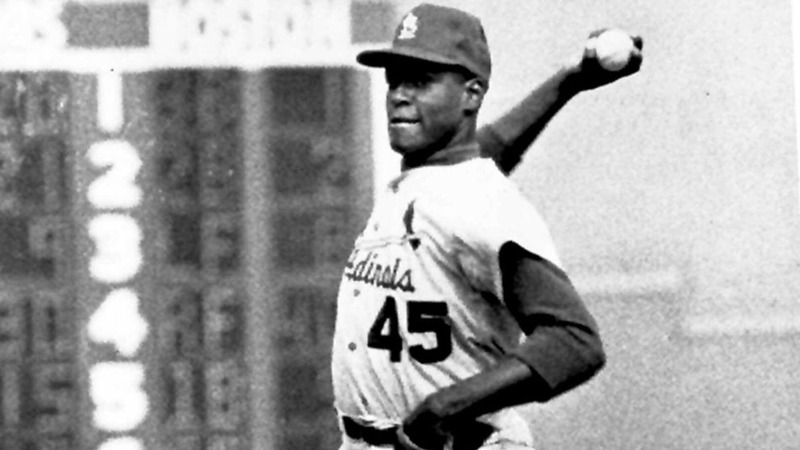 Bob Gibson, so good in the opener, was even better in Game 4, tossing a five-hit shutout to beat the Sox, 6-0, as Santiago failed to escape the first inning. It was Lonborg's turn in Game 5, as he followed up his one-hitter in Game 2 with a five-hitter. The Sox led just 1-0 entering the ninth, but they scored a pair of insurance runs, which made moot Roger Maris' solo homer in the bottom of the ninth. Fenway Park hosted Game 6, and the Red Sox stayed alive with an 8-4 triumph. The score was tied at four until the bottom of the seventh, when Boston sent 10 men to the plate and scored four times to break the game open. Game 7 matched Gibson and Lonborg. Gibson was brilliant once again, allowing only three hits, but Lonborg was working on just two days rest and clearly didn't have his best stuff. The Cardinals scored two runs in the third, two in the fifth, and three more in the sixth off Lonborg to put the game away. Gibson struck out George Scott to end the 7-2 contest, and the Cards were World Series champions once again.